, c/ Achova 2, Guadalest. 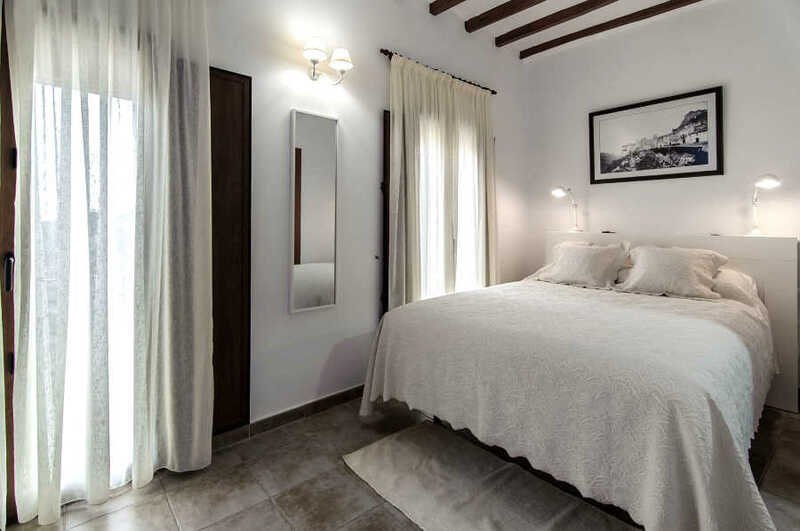 Cases Noves is a traditional Alicante village house, that is now a home-from-home for visitors to the lovely Guadalest valley. From the front of the house, it enjoys wonderful views across open countryside right down to the sea. And of course, Guadalest itself is a picturesque village crowned by a castle atop a huge rock outcrop. Care has been taken to retain the typical character of a village house, its wooden beams and sturdy stone walls, while endowing it with modern comforts. The lounge is a comfortable place to relax, with an open fireplace for the winter. There is a reading room where there is wi-fi and a computer for guests to connect to the internet, and a television room where board games are also available. Outside, the terrace has fantastic views stretching across the village, the Guadalest valley and the Mediterranean sea; a perfect spot for an evening aperitif before dinner. 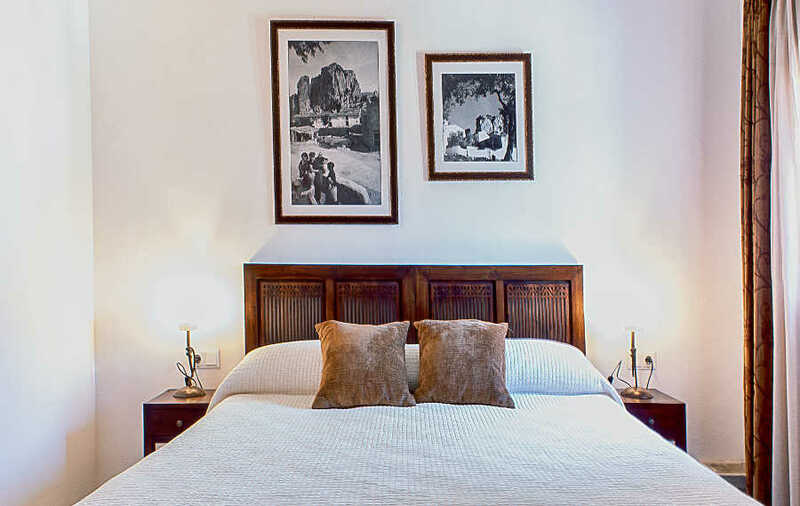 All the guest bedrooms make full use of the original features provided by the house's original builders, combining them with charming modern furnishings and facilities; full bathrooms with hydromassage showers, Apple tv's, iPads (the first hotel in Spain to provide them) and air conditioning. Thanks to Toni's efforts, the hotel has the best available walking information. Just choose your distance, time and level of difficulty and he will provide suggestions complete with a map, directions and even photos of the important waypoints. Cases Noves doesn't have its own swimming pool but guests have free access to the local pool in its a privileged location below the cliffs, where they are welcome to spend a pleasant day becoming a part of the village life. There is so much to see and do in Guadalest that you may never get round to travelling further. Cases Noves is for adults only: under-18s not admitted. Six days a week, Sofia offers the choice of a traditional "menu de la noche" dinner, or a la carte in the intimate little restaurant or on the terrace. On Saturday she provides a fabulous Tasting Menu that consists of a starter, 10 different tapas, dessert and coffee. Ample breakfasts include juices, cereals, cold meats, bacon, eggs, toast, preserves, tea or coffee. What better start to the day than breakfast on the terrace, enjoying the sun as it climbs into the sky above the Mediterranean sea? Swimming pool (fabulous location; much more than just a pool, 150m from the hotel). Open mid-June to mid-September (flexible). Depending on the time of year, there are various activities to see and join in, like mushroom picking, grape harvest and pressing, almond harvest (and don't miss the almond blossom in spring), and the olive harvest. Aitana: Queen-size double bed. Views of the Aitana mountain range, Guadalest valley and the bay of Altea. 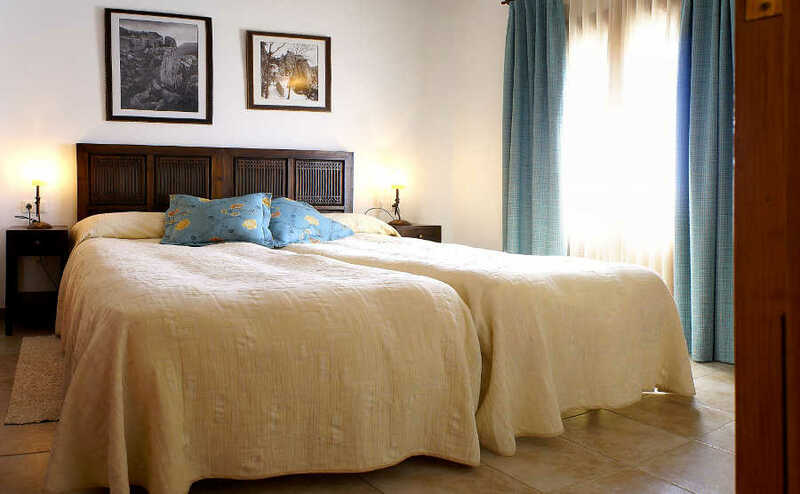 Xorta: Double bed or twin beds. 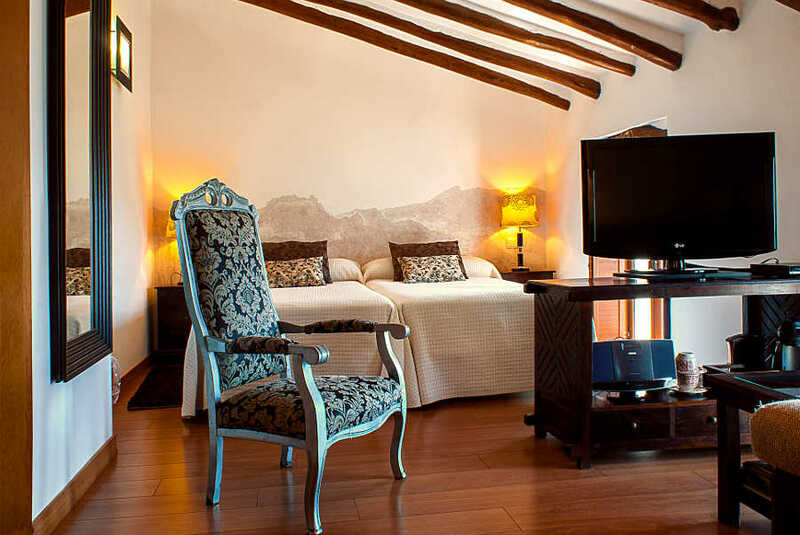 Oriented towards the Xorta mountains this room is a larger rooms decorated in a traditional style. Views to Guadalest castle. Bernia: Double bed or twin beds. Lovely light room with duel aspect. Views towards the Bernia mountains, the town of Guadalest and the coast. 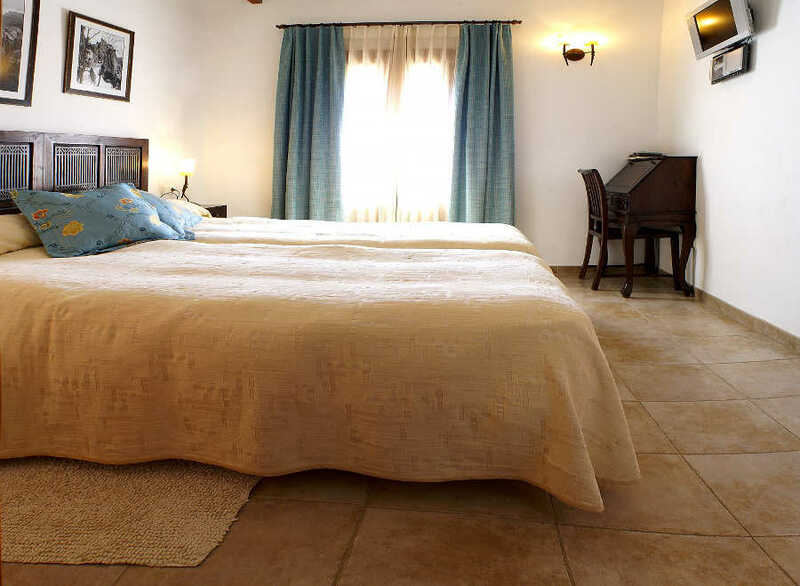 El Castell: Double bed or twin beds. Possibly the most romantic room where parts of the original stone wall and the beamed ceiling have been preserved. 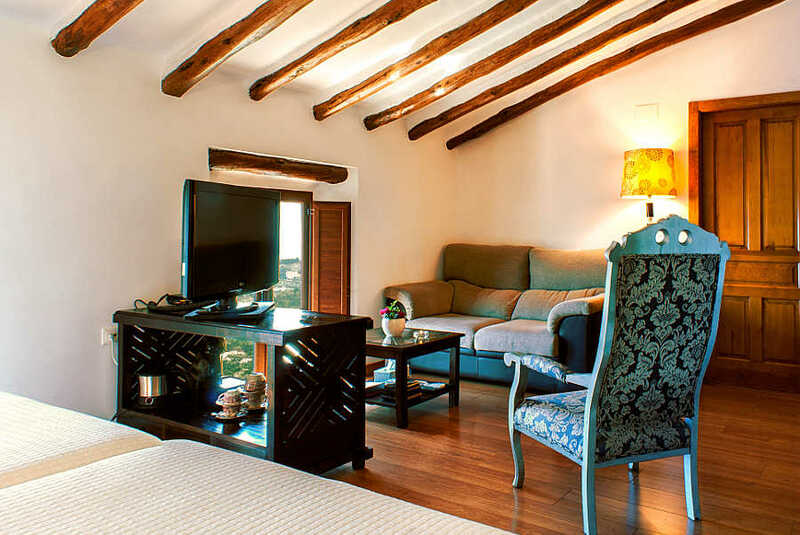 It offers views of the Xorta mountains and the Guadalest Castle. Guadalest: The largest room with the best views, on the top floor. Double bed or twin beds. All the same facilities as the other rooms, plus DVD/CD player, minibar, tea and coffee making. Stunning views of the valley of Guadalest, the Aitana mountains and the bay of Altea. We stayed at Cases Noves for 1 night in early September. Our stay was exceptional. Toni and Sofia are a brilliant team. Their attention to detail in terms of their house, meals and customer care exceeds expectations. We particularly enjoyed the tour of the house, and the iPad technology. The food prepared by Sofia, was wonderful. We have never had such an extensive breakfast, so many courses, it was a treat. We stayed again at Casa Noves in Guadelest. Once again the service and hospitality of Toni and Sophia were excellent. I just want to say that we had the most wonderful stay with Toni and Sofia. I can't wait to return. The food and surroundings were superb. I can't not speak highly enough of our time there, unfortunately it was only one night. We have just returned from a two night stay in the Hotel Cases Noves at Guadalest. It is a very attractive village - the most visited in Spain; the only negative aspect to this is that the shops and restaurants are tourist-oriented and there are crowds of people every day. The Orduna House Museum and Castle (linked access) are well worth a visit. The upper square is charming and gives an impressive view over the reservoir and surrounding hills. Our host and hostess provided us with an outstanding experience. The hotel is genuinely the "home" of the owners - Toni and Sofi - and has all the facilities needed for a restful and full-comfort stay. We were in the "superior" room - well worth the extra charge. It was well designed and equipped with an en suite bathroom and great walk-in shower, settee, large king-size bed, TV with international stations, Wi-Fi, DVD and stereo plus tea and coffee making equipment. 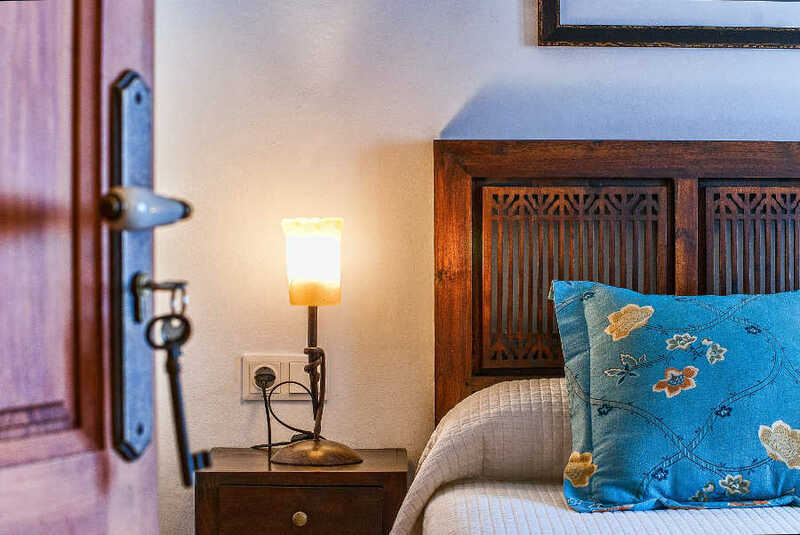 The ground floor rooms are tastefully decorated and provide separate music, TV and rest/read rooms/areas with "trust" bar and beverage facilities. Our room and the terrace provide magnificent views down the valley to the sea. The food was excellent. Each breakfast was different and beautifully presented. There was a choice of dinners - a la carte or set menu - we ate from both and they were equally delicious - "cordon bleu" rating for the chef (Sofi). In our case the weather was warm and mild and we ate all our meals on the terrace. The icing on the cake is the welcome and service from Toni and Sofi - nothing is too much for them or left to chance. Our thanks to them for a memorable stay. We will undoubtedly return and wholeheartedly recommend it to anyone who appreciates lovely scenery and high quality facilities, food and service. Excellent hotel run by Toni and Sofi. They both work very hard to make your experience memorable. Food and accommodation both of a high standard. I would highly recommend this hotel. We would just like to say we had a wonderful stay in this 'little hotel'. The owners, Toni and Sophia, are great hosts making every guest feel welcome and part of the family. Their attention to detail is brilliant and the accommodation is very homely and comfortable. The food was excellent and their breakfasts kept us going all day! It was quite easy to while away the time just taking in the breathtaking views from the hotel. We have no hesitation in recommending Cases Noves to anyone looking for hotel accommodation in the area. We were 10 people that had a wonderful stay at Cases Noves. We were warmly greeted by Sofia and Toni. Both the hotel and the food is highly recommended, in addition to two wonderfully nice people. I look forward to be there again. 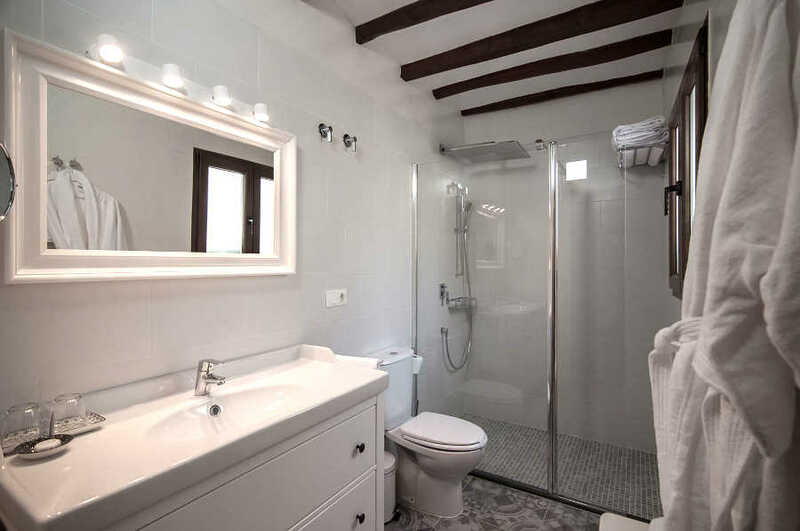 We were extremely pleased with our booking: Cases Noves in Guadalest. We cannot praise Toni & his wife enough. The accomodations were first rate & the food was fabulous -- especially the dinners. Having dinner also at a B & B was great. We highly recommend them. And we have mentioned both their establishment & Little Hotels to others. The hotel and Guadalest are an oasis of peace and tranquility but also full of fun and laughter. Toni and Sophia deserve to be very successful. We would recommend anyone to stay here and enjoy themselves as much as we did. We shall return. We loved Cases Noves - what a little gem! It was so comfortable and a beautifully restored property with fantastic views of the valley and the town. We enjoyed a delightful dinner and a wonderful breakfast. For someone who only nibbles a slice of toast and slurps a cup of coffee in the mornings I struggled to eat the fresh fruit, freshly squeezed orange juice, consume the delicious apricot yogurt, demolish the enormous apple danish followed by fabulous, creamy scrambled eggs with sausage and toast and preserve all washed down with frothy coffee!! Toni and Sofia are a delightful couple - so welcoming and keen to make our short stay as comfortable, enjoyable and interesting as possible. There is also a charming but shy black and white moggie who adds to the attraction! We left armed with cards to distribute as widely as we can. 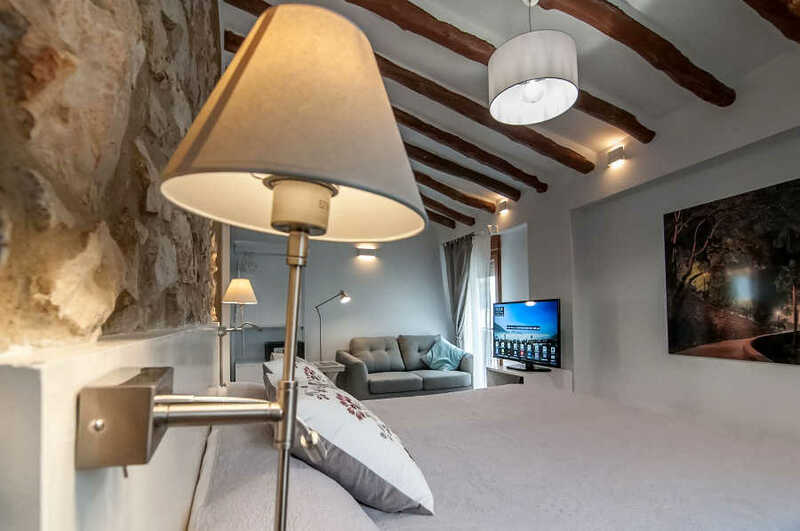 We have stayed at a number of establishments booked through Little Hotels of Spain and each has been perfect but Cases Noves is quite exceptional and we look forward to returning before too long. We recently stayed 2 nights at Cases Noves,Guadelest. Cannot praise this place enough. Rooms are small but very comfortable,lounges are very comfortable, food is excellent and above all the welcome and service were second to none. The view are breathtaking from the terrace were we had excellent breakfasts and dinners. All for a very reasonable price. We would not hesitate to return. Highly recommended. Many thanks for the booking, very efficient. We enjoyed our stay very much, we will be using little hotels again in the future? This is a fantastic hotel in a beautiful location. The owners, Sophia and Tony are great people and can advise on various places to visit in the area. The hotel is immaculate, very modern but retains an old fashioned feel. Breakfast was superb, very healthy and served at your leisure! We can also recommend bar Guadalest for Tapas and refreshments - owned by Sophia's brother! Excellent service and friendly "bantar" from the young barman. I would like to tell you that we had a brilliant time while staying in Cases Noves in Guadalest. The hotel was beautiful and we were made to feel really comfortable. Our breakfast both mornings was beautiful and we would without a doubt stay there again. The surroundings are magnificant and the hotel even better. The hosts are very friendly and helpfull and the fact that the food is close to a fivestar restaurant doesn?t make it worse. 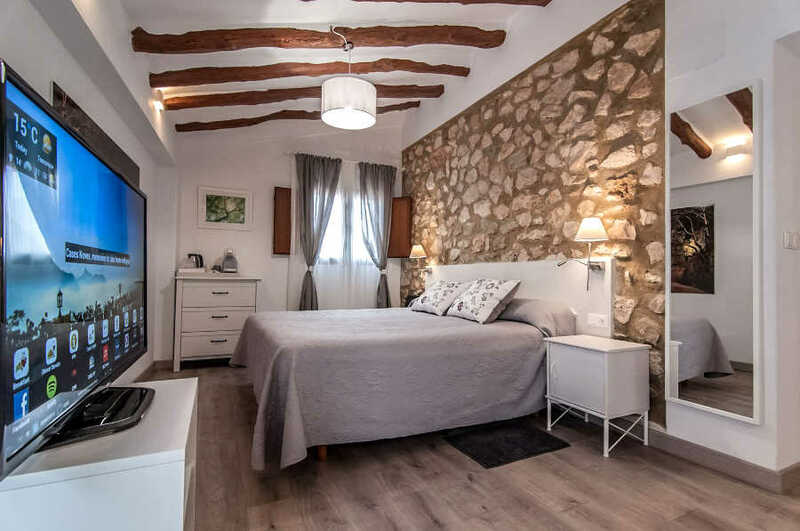 The hotel has a very high standard with a good mix of new, modern and fresh style combined with the traditional Spanish way of building and decorating. It is a strongly recomended accomodation if you are to visit Guadalest or its surroundings. We had a lovely stay on Monday 5th April. We were made very welcome and were delighted with the room. This was immaculate and the beds were so comfortable. The bathroom was equipped with everything we could need with an uunusual spa shower. With TV,CD & DVD player it was tempting not to leave the room. We cant fault the food at dinner and the breakfast was particularly delicious. We had a lovely night and will definitely be making a return visit. The experience at CASES NOVES in Guadalest far exceeded our expectations. This rural hotel was clean, comfortable, well equipped and had superb hosts. Every comfort was afforded and both the evening meal and breakfast was a delight with no strict meal times and beautiful rustic rooms. I would highly recommend this hotel and will return in the future. 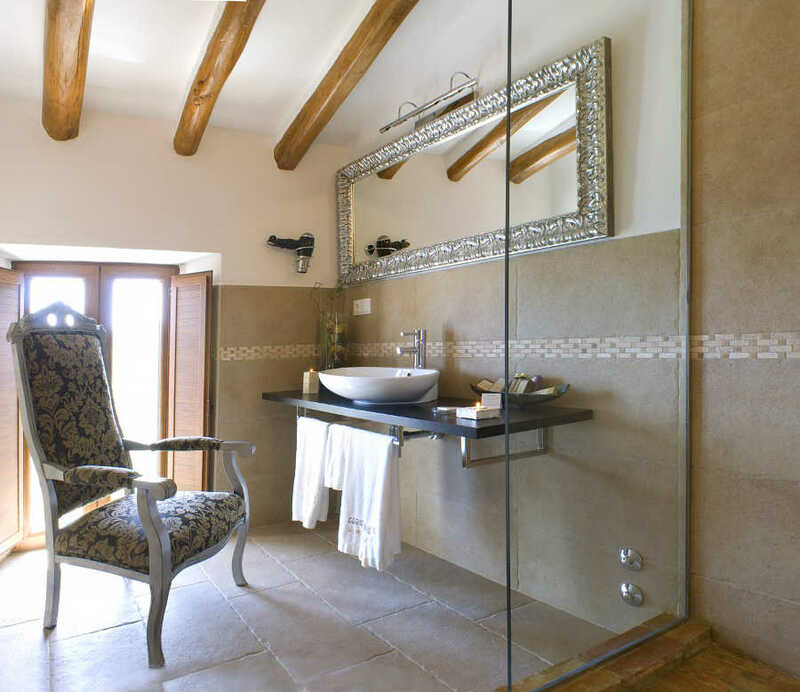 The hotel Cases Noves in Guadalest Espagna was absolutely top perfect both from material and human point of view. P.S. : Please do not interpret my enthousiasm as suggestion to rise the price! Absolutely wonderful. Perfect in every way. We will certainly stay in a 'little hotel' again. Toni and Sofie as hosts were absolutely brilliant. I don't know what there background is but they have obviously stayed in hotels where there were missings and listed them. They have now ensured there are no missings in their establishment. It was an absolute delight to stay somewhere where it was total relaxation and everything was as you hoped - indeed better in every respect. Please pass this on to Casa Noves. We have an apartment just over an hour away and will definitely take friends to Casa Noves again and find an excuse for an away night for us. We must go on a Saturday so we can try the tapas evening. Little Hotels will be a definite site to visit if we are looking for a relaxing break if this is the standard we can expect. We stayed three nights at Casas Novas at the beginning of september. It is a lovely, homely hotel and the owners, Toni and Sophie did everything they could to make our stay as enjoyable as possible. We ate at the hotel each evening. It was a plesent surprise to go out on the terrace and find two tables (there was four of us) set out with table cloths and candles. It was all very special and made the stay even more delightful. We would recomend a stay at this hotel if you are in the area and would even recomend making the effort to travel to this hotel. We stayed in Guadalest for one night at Hotel Cases Noves and were met by a very friendly English speaking couple who own and run the hotel. Our room was very nice with tv, cd player, and a great power shower, the hotel had free internet access and wifi on request. A great and very reasonably priced dinner was served on the patio with great views of the surrounding hills and mountains, breakfast was the same and got our day of to a great start. Our only mistake was that we didnt stay longer. Guadalest is somewere we would like to go back to some time and would definitly stay at Cases Noves. We (3 friends and I) spent two nights at this hotel. We were delighted with the whole experience, and would highly recommend a stay here. Our one night stay at Cases Noves in Guadalest was perfect. Tony and Sophie were the perfect hosts, leaving us to our own devices but letting us know that they were there if we needed anything at all. The room was beautifully decorated and clean with the most amazing views out to sea from our balcony. Enjoying our breakfast on their patio on our own in the sunshine with the castle in view was a high point in our holiday. We would definately recommend it as a place to stay and hope to return there ourselves one day soon. We are in the middle of our weekend stay at Cases Noves and I just cannot say how much we are enjoying our stay here. Tony and Sophie are such a lovely welcoming couple who are totally making our stay complete in their beautiful home-from-home family hotel. 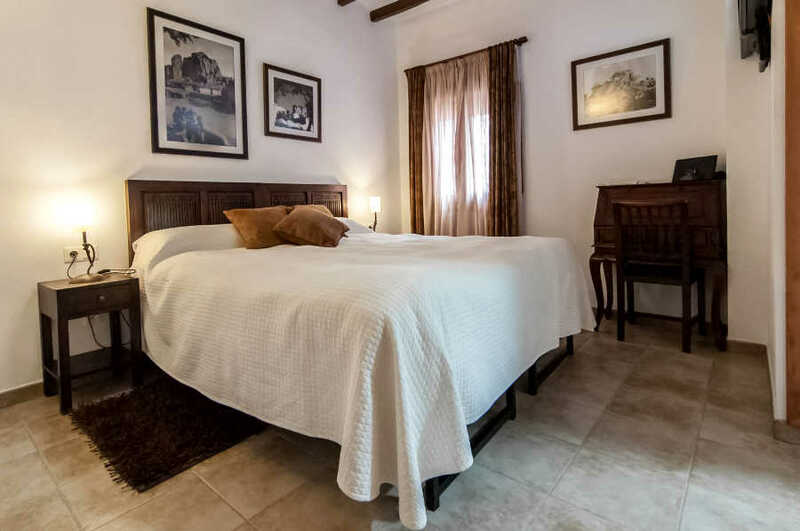 The bedrooms and bathrooms are beautifully furnished and spotless and Tony and Sophie are so friendly that we would love to be staying longer. We cannot speak too highly of the lovely meals we are enjoying here and we do wish them continuing success. We had a fantastic stay in Guadalest. Sophie & Tony were truly amazing hosts. The Hotel was perfect the food outstanding. 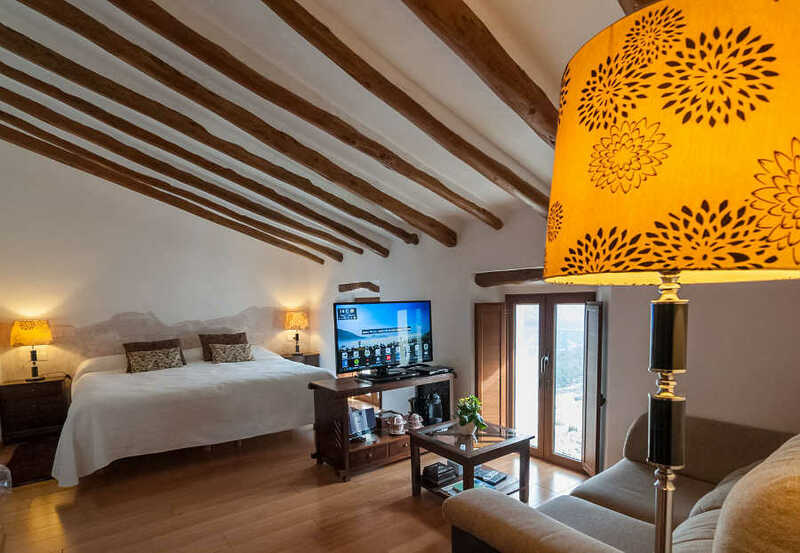 We would definitely recommend staying at Casa Noves. Just one problem and that was the local bus. We went from Benidorm on the 1 and only bus a day when there were 6 passengers but it was FULL for the return journey and so we had to have a taxi back. So be warned if you use public transport. The hotel we stayed in Guadalest (Cases Noves) was brilliant. Tony and Sofia the owners of the hotel were really friendly and trying to make our holiday as good as possible.We are sure that we will remember these two days as one of the best days of this year. Nicky and Paul would like to say that we thought Cases Noves was a lovely guest house with excellent hosts of Sophie and Tony. Nothing was too much trouble and the welcome tea and homemade biscuits were delicious as was the superb breakfast. We were made to feel very welcome but also given our privacy and the standard of the accommodation was excellent, our room having lovely views. Would definitely recommend to anyone wanting accommodation in that area. A beautiful setting for this charming small hotel. The building has been very tastefully renovated and breakfast on the lovely patio is memorable. The hosts Toni and Sofia could not do enough to make our stay enjoyable. We originally booked for a two night stay at Cases Noves but enjoyed being there so much that we returned the following week for a further four nights. We were told that it was our home for the duration of our stay but it was more than that because Sophia and Toni looked after us so well and gave us an insight into their area with superb local food and information. It was an excellent base for walking,biking and climbing. Perched under a magical castle at the top of a long valley that sweeps between razor-backed mountains Cases Noves is a small hotel with lots of character. It's beautifully decorated, with good facilities and excellent food. What really makes an impression though is the welcome and service provided by Toni and Sophia. It felt like visiting friends and we were very sorry to leave. Cases Noves was superb in every respect. Toni and Sophia's welcome was second to none (we agreed that a similar establishment in the UK would never have welcomed us so warmly given that we were travelling with two 2 year olds). The house was beautiful and Sophia's meals and Toni's service first class. I am so pleased that we booked through Little Hotels and discovered such an idyllic spot! No deposit. Just a credit card number is required to guarantee a reservation. If cancelled or modified later, or in case of no-show, 100 percent of the first night will be charged. This incredible village location with spectacular views will give you a holiday you will never forget. Meanwhile mine hosts Toni and Sofia are two of the nicest people you will ever meet and their attention to detail is unsurpassed. The house is more than 70 years old (built in 1932), and although it has been restored, all of the original characteristics of a rural mountain house have been retained. It has a combination of solid stone walls, high ceilings, wooden beams, and stone floors, which are typical of the area. Whilst retaining its original charm, it has all the latest comforts that you would expect from a recently constructed establishment. 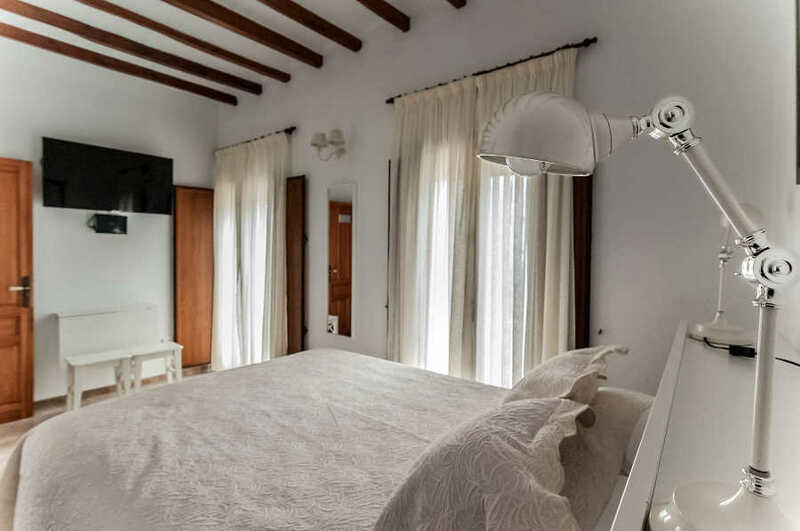 With its situation at the edge of the village, all of the bedrooms have wonderful views of the sea and the Valley of Guadalest.